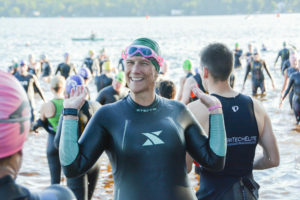 If the water temperature is 78.0 degrees F or less on race morning all participants may wear a wet suit and be eligible for rankings and awards. If the temperature is between 78.1 and 83.9 degrees F on race morning, participants may wear a wetsuit, but will not earn points towards their national ranking or be eligible for awards (they will still receive timing splits). If the temperature is 84.0 degrees F or higher, no participants will be allowed to wear a wet suit. That covers wetsuits… but what about skinsuits? Skinsuits can be worn regardless of water temperature as long as they are on the USAT approved list of wetsuits which you can find with a click here.